Sorry about the delay; I had technical issues and then got distracted (my Spring Design Alex arrived on Wednesday). I would think that most people are familiar with the Edge, but just in case you're not, here's a brief description. The Edge is an unique dual screen device the Edge is about the size and shape of a netbook. 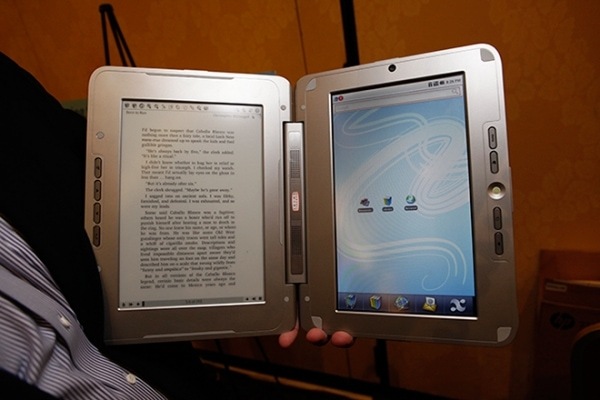 It has 2 screens, one is a 9.7” E-ink screen and the other a 10”LCD screen. (Obviously it does not have a keyboard.) Both screens are touchscreens; the E-ink has a Wacom screen and the LCD touchscreen is capacitive (fingertip friendly). It weighs 3lbs, and the weight is fairly evenly split between the 2 halves. The LCD is on the right. There is a webcam above it, and 4 buttons and a jogdial next to it. There is a slot behind and below the LCD screen for a Wacom stylus; you' need that stylus for the Wacom touchscreen. All the ports, card slots, and battery are on the left half of the Edge. There are 4 buttons immediately to the left of the E-ink screen. The battery is on the lower edge, and there is a sim card slot, SD card slot, mini USB port, and a Wifi switch on the upper edge. On the left edge of the Edge are 2 USB Host ports, volume buttons, microphone & headphone jacks, and the power button. I came up with a list of questions when I started this review, but I'm not going to answer all of them. Now that I've used the Edge, I don't think some of the questions are worth answering because they're redundant or invalid. How is the Edge and a laptop used in comparison to the same laptop and textbooks? I could not comfortably use the Edge with my laptop. I did try, but it seemed to me that the Edge and my laptop both needed to occupy the exact same position on my desk. Shifting one to the side, or propping one on the other, was just too awkward. But that's okay. I think that the Edge by itself is a reasonably good replacement for a laptop & a paper textbook. It worked (for most things). Sometimes I need to type, and the onscreen keyboard just doesn't cut it. BTW, while I think the Edge can replace a laptop+textbook, the same does not apply when you add a second, third, or fourth book and use them all at the same time. I think you're going to want to keep those extra books separate from the Edge. But, I did find I could use the Edge with the extra books, and it worked well. Could the Edge be a complete replacement for a netbook? Maybe, but it would depend on how you're going to use it. If you want to use the netbook as a smaller version of a laptop then the Edge won't suit you. The Edge is intended to complement a laptop, not replace a netbook. You use the Edge in ways that you can't use a netbook. Also, I think you'd be better off with a laptop+Edge than a laptop+netbook because of how the Edge complements a laptop. I think it would be more productive. This might be a little redundant, but I’m thinking of getting an Edge for school use and as a complement to my PC. Since you say it works find with laptops, I was wondering if that applies to PC as well?